Window shades, roller shades, solar shades, screen shades, roman shades, transitional shades, woven wood shades, exterior shades, motorized shades—so many names, so many styles, so much information. How can you possibly know which kind of window shade is the right solution for you? We’re here to help. When you call Window Works for your free shop at home appointment, either Kim or LuAnn will meet with you to assess your window treatment needs and make the best recommendation from all available options—based on the structure of the window, your personal style and your budget. Roman shades are currently the single most popular window treatment in the interior design field today. Why? Simply put, roman shades truly can be adapted for nearly any room in your home, enhancing nearly every style of home décor. As versatile as they are beautiful, most styles of roman shades fit as nicely into your formal dining room as they do into your children’s nursery. At Window Works we can design custom roman shades in a variety of styles and an infinite variety of materials. A huge plus with roman shades is that—through the use of tape trims, accent banding and pre-made cord trim—we can design romans shades that are unique to your personal design style and to the feeling you want to express in your home. Whether you are looking for breezy, linen roman shades that evoke the casual, upscale feeling of a Hamptons beach house or you prefer lovely silk roman shades elegantly adorned with decorative trim for your luxurious master suite, we are here to assist you at every step of the way. Flat roman shades and hobbled roman shades can be designed using one of the many fabrics in our showroom, from sheer fabric to upholstery-weight fabric. 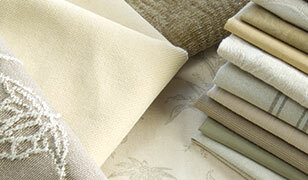 We represent quality fabric houses like Kravet, Romo, Harlequinn, Stout, Maxwell, Fabricut and many more. Custom flat and hobbled roman shades can also be designed using woven wood materials—from matchstick shades to bamboo shades. At Window Works, you will find distinct woven wood patterns from Grace Richey Clark, Horizons, Hartman & Forbes, Conrad and Provenance by Hunter Douglas. Roman shades can also be designed using a wide selection of solar screen materials. This option is ideal if you want protection from the sun but you want to preserve a fabulous view. After we have helped you narrow down the style, fabric and trim for your roman shade, we will guide you in choosing the proper operation method. We offer standard cord lock, continuous clutch control, cordless operation, battery remote control and hardwire motorization. Each has their place in meeting your needs to function, aesthetic and window treatment budget and we are here to help you make the best choice. Allure Transitional Shades are a one-of-a-kind style shade that allows you to have the practicality of a horizontal blind and the softness of a fabric shade. The unique design filters light and privacy with a slight adjustment on the shade. You can easily transition from complete privacy to semi-privacy to complete openness and natural light. Allure Transitions shades are also available with room-darkening features and, best of all, they are available in dozens of colors, textures and patterns to coordinate with your home décor. Allure Couplitaire is really two shades in one—an Allure shade to the room side and a Genesis privacy roller shade to the street side. This design combines the best features of roller shades and Allure Shades in one window treatment. Allure Modernaire is an Allure shade without the cassette valance. This is terrific for low profile installations or if you are going for more bare, minimalist décor. Allure Visionaire is the vertical version of Allure Transitional Shades. But this is not your grandma’s old fashioned vertical blind! This is the modern window treatment solution for sliding doors and long expanses where a vertical design is more practical. And, when installed on your patio door, the Allure Visionaire rolls up into its own fabric-covered headrail. It is ideal for tight spaces where the typical vertical blind stacking on the window is a challenge. Like with nearly every window treatment and awning we offer the Allure Transitional Shade is available both with manual and motorized operation.